A brief update on the market as April Week4 starts. Consolidation between 1,696-1,707 still persist, albeit a low close today below the 1,700 mark. 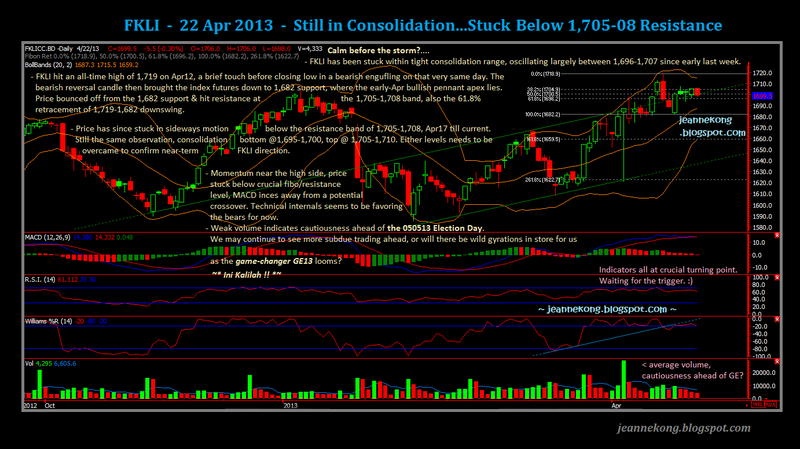 The tepid volume indicates traders staying to the sideline as the GE13 Election Day looms. Last week's analysis still largely intact. A breakout from either the consolidation top of 1,707-1,710 to confirm near-term upside to retest the all-time high of 1,719; or breakdown of the consolidation bottom of 1,690-96 to find further support at 1,680-85 & fibo strong support at 1,660-65. Downtrend resumes again today, after price gapped down at open & subsequently close near day low at 2,256, firmly below past week's consolidation bottom of 2,260-70. Repeating my target of 2,220-30, which has gotten much closer following today's downward movement. Since this is just the Wave III counting down from 2,593 latest pivot high, we might well see a breakdown of the major 2,210-20 support, eventually. Nonetheless, we will have to first see a counter-rally after the current downswing is completed, before a mojor breakdown to below 2,210 mark. Exports is down again for the first 20days of April. This is bad news for CPO price as production starts entering a cyclical high period from April to end-June. Export has to pick up to offset the possible rise in production, so we can see the record stockpile eases further by month-end. Well, now it seems pretty far-fetch with the slowing export demand as estimated. Let's see how well the export demand can go in the remaining a week or so, before we close Apr'13. 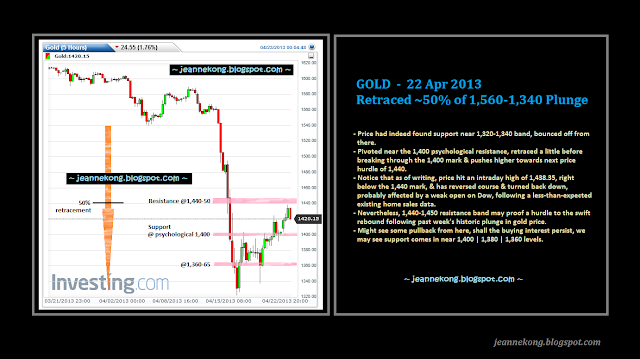 On a side note, GOLD has indeed rebounded from 1,320-40 support band & has just hit a high of 1,438.35 in the evening. A weak open on the Dow sent price down slightly, hovering around 1,420-27 level, as of writing. As discussed in my previous post, written in the wake of the historic Gold Plunge through Apr12-15, price may rebound from 1,320 low to retrace part of the drop. Taking the high of 1,440, price has since recovered about 50% of the 250+pts plunge early last week. Also, 1,440 level is one of the hurdle to be crossed for further rebound, next level to overcome being the 1,480-1,500 psychological mark. As of writing, price seems to be resisted by the 1,440 level, now pulling back from it. Buyers may come in near support levels of 1,420 | 1,400 | 1,360-80. Healthy pullback for the rebound shall not see price re-visit levels below 1,340-60. Working towards my month-end target! FKLI did close lower at 1,695.5 today, from yesterday's 1,699.5. Hence, a bearish crossover on the daily MACD is confirmed, signalling potential weakness ahead. Also, note that momentum has tilted down in a more convincing way, a change from past week's flattish pattern, which saw them stuck below their respective OB zones. I'm keeping a bearish bias now for the week, or probably until end of month. Still, am waiting for a more decent upward retracement for my short entry. If the retracement doesn't materialize, probably a short on breakdown of today's congestion area of 1,693-1,697 is the backup choice, with a less enticing Risk:Reward ratio, as 1,690 itself is also a minor support down there. Did a strong rebound at morning open, all the way to 2,288 high before closing for lunch. Afternoon open saw a gap down & continue down to day low of 2,259 before a quick rebound for a close near day's mid-range at 2,272. 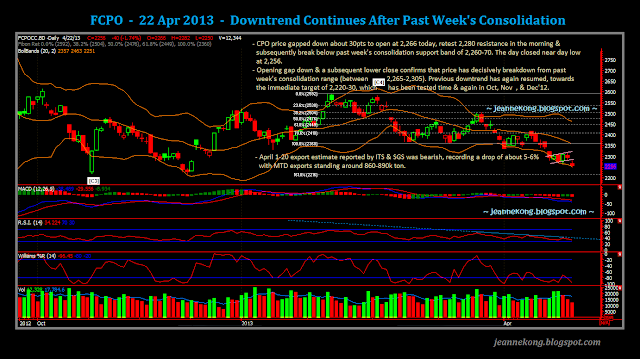 Technical internals seems to suggest today's rebound as a counter-rally move against the primary downtrend. If, the 2,280-90 resistance is to be overcame tomorrow (covering Monday opening gap), we might see further rebound back to find 2,305-2,315 high. Shall the downward movement from Monday decides to continue, we need to see a breakdown of the 2,250-60 support, towards the next floor near 2,220-30. As of writing, SoyOil seems rather weak, hovering around day low of 48.40cents. Let's see if we will get a bullish/bearish lead from SoyOil tomorrow morning. Gold is still hovering around yesterday's day low range of 1,410-20. I'm seeing a bearish flag on the hourly, with potential downside target near 1,400 support. A break below 1,410 shall also means a breakdown of the short-term uptrend line supporting the climb from 1,360-80 low, which should invite more technical selling. Price is now retracing its strong rebound from past week's 1,320-40 low to recent pivot high near 1,440. Strong support shall come in around 1,380-1,400 levels.